Everyone has heard stories about robberies and violence. What will you do if you or aloved one faces such a threat one day? In order to help prepare you such trouble, we will be holding a beginner level self-defense seminar class here in NYC. ・Wisdom to avoid becoming a victim. ・The withdrawal method if you are grabbed. ・Gain insight on beneficial combat techniques. ・Wake up your dorment fighting potential. ・Japanease martial arts to train your mental strength. International Self-defense Do-Jo "SD Tornado"Representative. 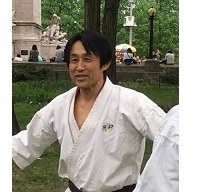 Born and raised in Japan.He was an instructor of Ashihara Karate and later established his own DoJo "SD Tornado". ・The meeting place is above the lawn on the back of the USS Maine monument. ・It will be held outdoors.